Marco Aguinaga may not be a patient guy, but when the sophomore quarterback gets a chance to play, he makes the most of it. The Monitor’s 2016 All-Area Offensive Play of the Year had the best game of his two-year career at Baker University last Saturday in Kansas, producing a trio of touchdowns and more than 400 yards of total offense. 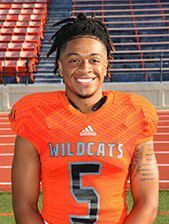 The Edcouch-Elsa product threw for 374 yards and three scores, connecting on 26 of 42 attempts to lead the Baker Wildcats to a 34-7 victory over conference rival MidAmerica Nazarene. The 5-foot-11, 189-pound quarterback also rushed for 57 yards on 13 carries and was able to overcome two interceptions to improve Baker’s record to 5-2 overall and 1-0 in the Heart of America Conference. Baker, ranked 17th in the country, is a small NAIA school located just shy of an hour southwest of downtown Kansas City, Mo. Aguinaga, who has been biding his time as the No. 2 QB since last year, started three games in 2017 after NAIA national player of the year Logan Brettell was injured. He went back to the bench after Brettell returned, but not before performing admirably, passing for 1,035 yards and four TDs to just 1 interception. This season, the sophomore was overlooked and became the back up again, picking up just 127 passing yards in spot duty through the first four games. However, in Baker’s fifth game the Wildcats’ offense stalled and coaches called Aguinaga’s number after halftime. He responded with 116 yards and two touchdowns, leading the team to 28 second-half points and 35-0 victory. That performance led him to start the next game against MidAmerica Nazarene. Now, it looks like the starting QB job is all Aguinaga’s. Focused on academics last year, Maranda Washington all but hung up her volleyball sneakers. 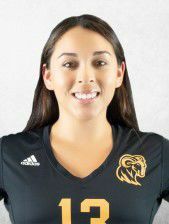 She said goodbye to her teammates, coaches and the Huston-Tillotson gym where she had excelled for three-straight years as an all-conference libero. The Edinburg Vela product was ready to move on to a school that had a major she wanted to study. Then after finding some other H-T students with the same problem, they banded and approached university officials with a proposal to expand academic fields of study. H-T listened, expanded and now Washington is back on the floor with the Rams as their only senior, and she’s doing fabulous. The 5-foot-1 libero is tied for the Red River Conference lead in digs per set at 5.3 (339 total) (26th nationally in NAIA), and she’s added 55 assists and 17 service aces, to boot. H-T sits atop the conference with a 6-1 record (tied with Our Lady of The Lake) and is 19-2 overall. 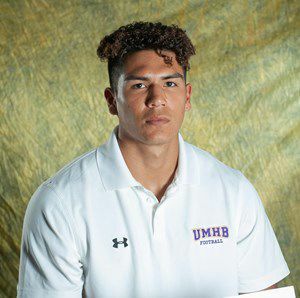 Mission Veterans’ alum Santos Villarreal and his Mary Hardin-Baylor football teammates have made life miserable for their opponents. The No. 2 ranked 6-0 Cru (NCAA Division III) have beaten up their opponents by a combined score of 364-35. Their closest game was a 26-0 shutout of Abilene’s Hardin-Simmons and the biggest win was a 91-7 shellacking of Albright College of Pennsylvania. Villarreal, a 5-foot-11, 195-pound senior linebacker, has helped spearhead MHB’s dominating defense. So far this year, the former quarterback has 20 tackles, five tackles for loss, one interception and one fumble recovery. Those are not eye-popping numbers, but they show performance (keeping in mind that starters rarely play more than a half for MHB), and that numbers are not above the team’s goal of another national championship. 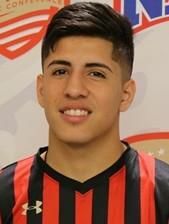 As a freshman in 2017, Adrian Rodriguez made a splash on Jaguars’ soccer team. He didn’t score a ton of goals in 12 starts but he nailed one in the NAIA Red River Conference tournament championship, which helped him get named to the all-tournament team. This season, the McAllen High School product has turned it up a notch – maybe two. The 5-foot-6 forward is the Jaguars’ leading scorer with 10 points. Rodriguez is tied with team lead in goals with three, and he is the team’s leader in assists with four. The sophomore, who has started all eight games this season, has 14 shots on goal for the 6-1-1 Jaguars. UHV currently sits in second place (5-0-1) in the Red River Conference. To say the University of Incarnate Word volleyball team is young is a major understatement. Most of them haven’t even faced the “freshman 15.” No matter, the Cardinals – with seven freshmen and four sophomores on a 17-player roster – are fighting. Even though they are just 4-15, UIW recently went on a 4-3 run in the schedule showing signs of life. McHi’s Julia Monday, a sophomore, is at the center of the team’s rebuilding efforts. The 6-foot right outside hitter is second on the team in overall points with 167 (2.78 per set) and has notched 148 kills, which is good enough for third best on the squad. Monday also has 46 digs and 18 blocks even though she doesn’t play a defensive role on the team. She has started 15 of the Cardinals 19 matches.